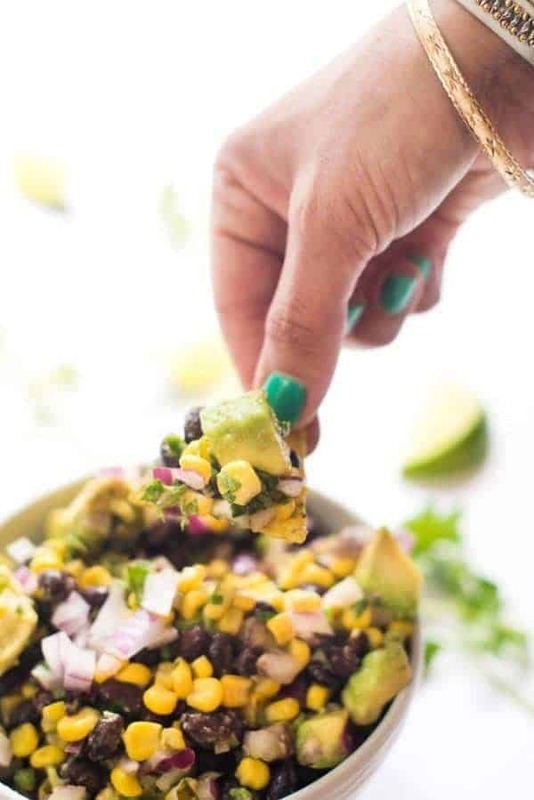 Avocado, Black Bean and Red Pepper Salsa is packed with flavor and loaded in vitamins, nutrients, protein and fiber. My husband recently attended a week long conference with scheduled evening events which meant one thing and one thing only: Mexican Fest 2013 for this girl! As I’ve mentioned a million times, he is not a fan of Mexican food. He doesn’t like melted cheese or cream sauces so that rules out 90% of Tex-Mex and he doesn’t care for cumin, cilantro or beans so that rules out the more authentic Mexican food I grew up eating. Needless to say, when the cat’s away, the mice will play. This protein-packed salsa is filled with locally grown sweet corn, red peppers, cilantro and jalapeño. Avocados and olive oil add a creamy texture plus tons of healthy fats. For the black beans, I used dried beans from a local farm and cooked up a large batch in my slow cooker. They were chewy with a bit of a bite and had so much more flavor than anything from a can. I froze two cups, used some in this salsa and used the rest later in the week when I made chicken and bean enchiladas. Confession: I ate almost the entire bowl of this in one sitting thanks to a giant spoon and a warm batch of Baked Corn Tortilla Chips. And I loved every bite. This bright and colorful salsa is packed with vitamins, protein and heart-healthy fats. 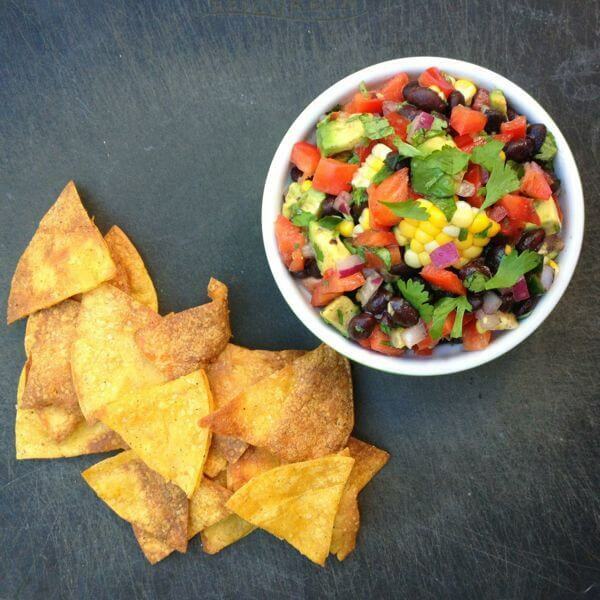 Toss all ingredients together in a large bowl and serve with tortilla chips. If you enjoy spicy food, leave the seeds and ribs in the jalapeño since that is where the heat lives. I am thrilled to be celebrating pepper season with these amazing bloggers as part of Food Network’s #SummerFest! I don’t know what I’d do if my husband didn’t like Mexican food! 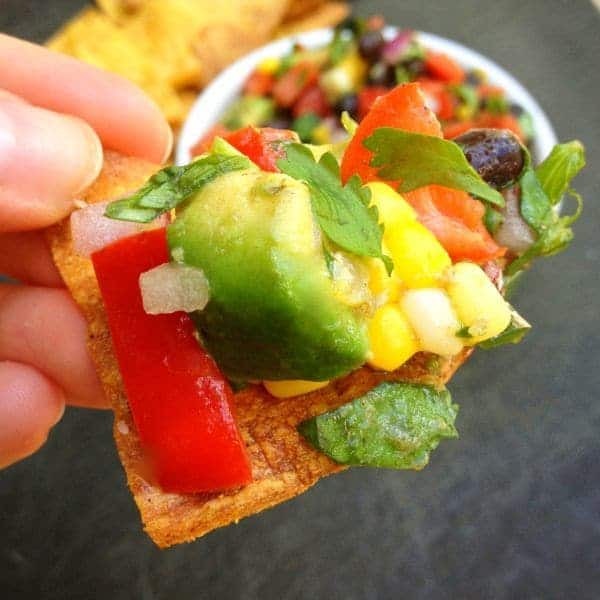 Love the avocado in this salsa! It is a sad situation… :( But he likes sushi and Lebanese food (neither of which he ate before me) so I’ll take it. I know!! He will eat baked beans coated in sugar or perhaps in a Minestrone soup but I have to hide them – lol. He’s essentially 5. I consider it a perk of deployments to fix what I like and my spouse doesn’t while he’s away. That’s a great perk!!! Good point! Now that I live on the border with Mexico, I’ve had a chance to become acquainted with real Mexican food, and I just love it. I’m grateful that my husband, who brought me here, does, too. Only problem: he doesn’t like avocado! 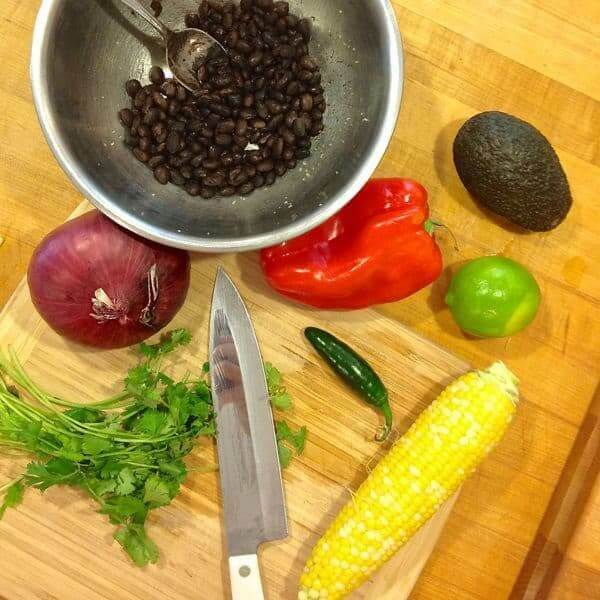 This salsa recipe sounds wonderful, so I’m saving it for when I don’t have to leave out the avocado… :-) However, it also sounds like it would be great even without the avocado. Thank you for posting this. It would absolutely be great without the avocado!! Another idea is to make it without the avocado then put half in a bowl for him then add avocado just for you. ;) I feel your pain!! KIM! So great to hear from you!! Going to check out your new blog!!! Thanks so saying hi!! That is awesome! What other dishes did you make / eat? 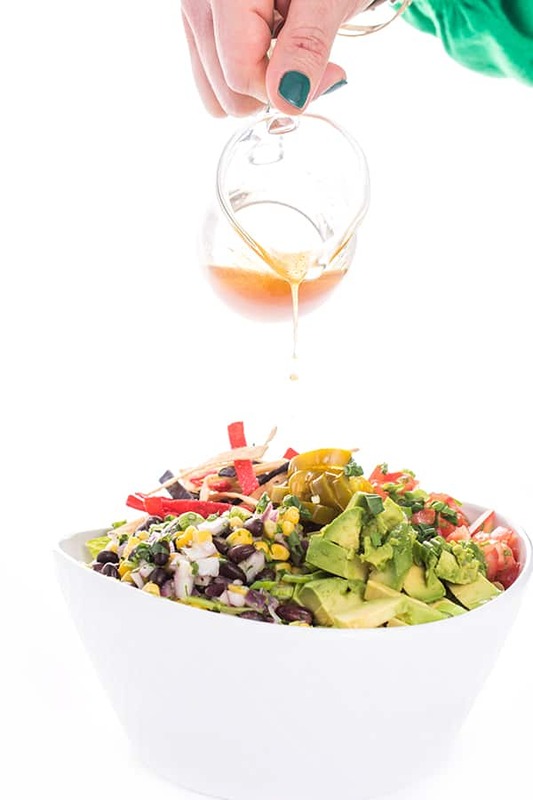 This salad is right up my alley, Liz! I love that you used all of my favorite summer ingredients, too! Looks so delicious and colorful. Perfect for scooping with chips or topping on grilled meats, chicken and fish. This looks delicious! I love making salsa and I don’t do it enough. The combination of crisp peppers and avocado is a great texture contrast that I’m sure I wouldn’t be able to get enough of. Yum! 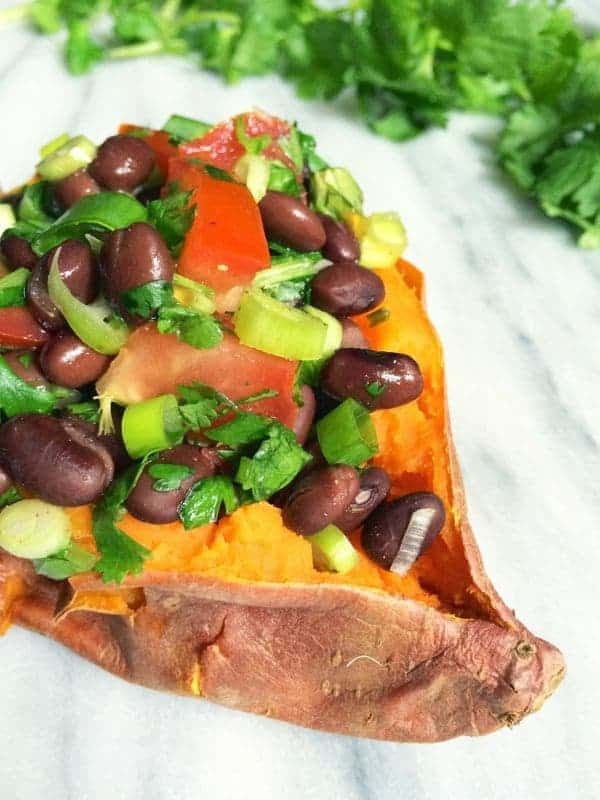 Dried beans in a slow cooker–why have I never tried this? Awesome idea! Mega heartbreak that the hubs doesn’t like Mexican food–I have similar “girly” nights when the husband is away: A monster veggie frittata. The crazy man won’t eat eggs at dinner. LOL I love that – what is it with men not eating frittatas? And yes, beans in the slow cooker was life changing for me too!!!! Be still my fiesta loving heart! Totes can wait to make this salsa. Also, I’m thinking I need to visit MI so we can go on a Mexican food grub crawl! When it comes to taste buds, my husband is the polar opposite of yours. He could eat Mexican food everyday of his life. So, that means that I know he’d love this salsa. 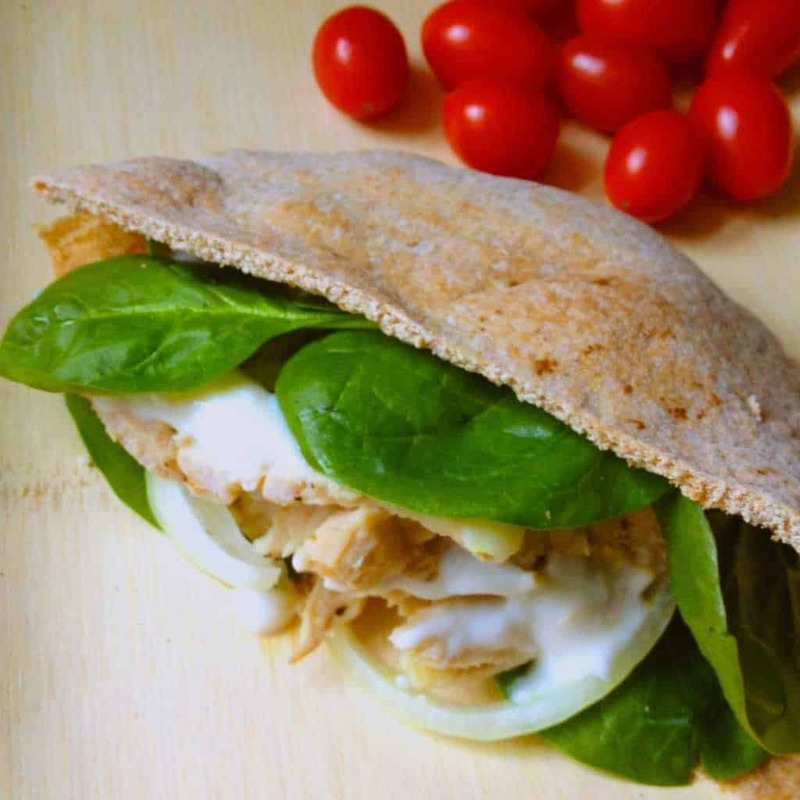 What a great way to kick up grilled chicken or fish. Yes, Please! This is my favorite salsa! YUM! Wish we could enjoy it together!! This is perfect for football games!! 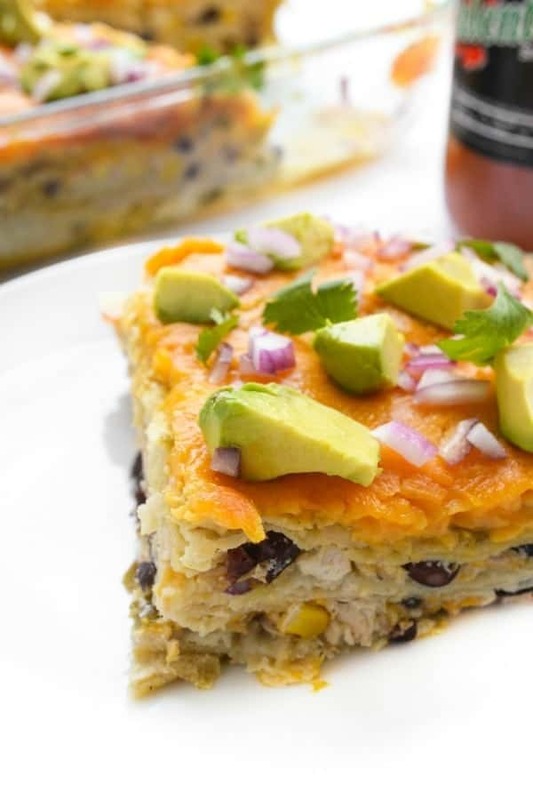 Crunchy corn, filling black beans, and creamy avocado…I think I could make a meal of this! I did – lol!! I had half a bowl for lunch the other day, it was so good! NOM. I need a full bag of those chips rightthissecond. I’m wishing I had some right now! !